A Nomadic booth rental delivers custom design impact, effective brand communication and functionality at significant cost savings. 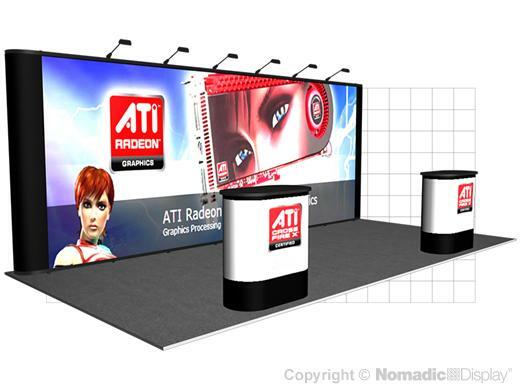 Our 20' booth rental is comprised of two Classic Instand® pop-up displays. Instand is the world's most popular pop-up display; you'll enjoy the impact of vibrant trade show booth graphics and cost efficiency. Instand's unique engineering will save you money on expenses associated with traditional displays such as drayage and set-up making this booth rental a "must have" for savvy exhibitors. 4 - Rolluxe Case - 41.75" x 16" x 16"